The long awaited interview with the real life Phiona Mutesi and Robert Katende from Disney’s Queen of Katwe is here! It was truly an honor to have met the real life Phiona and Robert after seeing this amazingly moving film. After seeing this movie I could only think wow! This girl triumphed through so many circumstances and with the support of her coach, her mother, her family and so many other people. She was able to achieve some amazing feats going on to play in the Olympics in Russia. All of my questions I had for them were answered in this interview, there are some great insights in here that I think you all will love to read about. Have you read the book before? What was your favorite part of the movie or the book? Were all of your question’s answered? Let us know below what you thought of the movie and what you thought about reading about and exclusive interview with the amazing Real Life Phiona Mutesi and Robert Katende. We asked this very important question that I think every parent ask’s their self when they see a movie like this. I asked myself what my kids would take from it and how they would feel when they saw the movie. Would they be inspired to push past their fear or being on stage and try out for that role in their school play, or will they go for their dream and do gymnastics? I feel like this movie really inspired me to support my kid’s dreams and anything they would like to take part in. You never know what their true calling is and how later on they will have their own story to tell their friends and loved ones. Lets here what Phiona and Robert have to say about what life lessons others can learn from chess. Question: What life lessons do you think children and adults can learn from chess? Robert Katende: There are several, actually, just generally in life and there are many values that we meet on a daily basis in our lives; In a child’s life you can involve them well to the platform of chess. You can tackle abstractive thinking, problem-solving, decision making, weighing options, and even responsibility because chess kind of mentors you in finding value and where you have to get comfortable with your decisions and don’t simply make moves. You should have a plan, you should have an objective, an activity objective. It gives you an opportunity to where you can have ideas and try to figure out how to bring them to reality. So you must get input in the integration of these values and principles from the game into your lifestyle. Question: Is the movie as true to life as it could be? Phiona Mutesi : Well, I liked it when I saw it. I couldn’t think that I was watching myself. But it was my first time in the big theater. I was on the Red Carpet; I think it was just my first time. I’ve never been in such a situation. But I’m like, come into that, I’ve heard, like, I feel like I shouldn’t be there, like, shouldn’t it be someone else. But it feels too huge for me. Question: Can you talk about mentorship and how that played a role in your life? Robert Katende: Yeah, surely it is something remarkable. I strongly believe maybe my general team have really done it. I have learned on being a father. Before I got a family, I was more in a training, so they really taught me so much about tolerance, patience and embracing each one’s ability. Because when it comes to the programs, it’s not so much entailed on chess but it’s more of focusing on an individual. And if the child is different- they have different abilities; different perspectives of life, and now you find yourself in this dilemma where you have to look at each child as an individual. And to me, it’s more of a community investment. You really choose to be in there and see how this important to them. Why? And then he said, “No, when my uncle comes back home, he comes back drunk, and he fights with auntie, and so they will break our board.” Now, this really hit me and I almost shed tears because for him, it was for the board, and me, I was moved to, what kind of trauma does this child go through at home? So it takes you beyond what you think, and that sometimes you, even you go- when it comes to mentorship, I’ve many times find myself going beyond the actual child, and going even to the people behind the child. Because some of the issues are actually, imagine, from the guardian, or the uncle, or the auntie, they have that role that they play. Sometimes once you see this child going through, they’re just symptoms, and they have a cause behind it. And sometimes you cannot keep on addressing the symptoms and that forces you to go beyond, and then reach out to even the guardians. Those who don’t have them, I got an opportunity to get to adopt them so that I am with them now. You can find them in my home in the hotel, and there are about eight kids over there. We sometimes even mentor them who know how to play chess. So it’s now more like a big family. But mentorship is not something really you can just say it’s on and then off. It’s an ongoing process. And it’s not like, I will come and teach you, and then go away, but you allow them to learn your weaknesses, to learn how you face difficulties, how you respond to them. It’s not a short case kind of situation, but you’re more like living with them on a daily basis, and they learn the positive way how to react to grief; how to respond to calamities if they occur. So you are their only model. They’re there to pick every lesson from you- so they become part of you. You open your home; sometimes I tell people that you have to allow them and give them–. They are there; they are part of you; they give you a call; they come; they say, “coach, we need to come.” So it is an ongoing selfless living, you know, but for the purpose of, trying to see how best how you can support in terms of—-. In the movie we get a brief look at how the Pioneers were first started, but of course, we would love to learn more! The movie has a scene that cuts to when the group is already big and the kids are already in the routine of how to get ready to play the game of chess. As you will see in the movie the Pioneers have grown up throughout the years and there are new ones everyday. How are they doing and what’s going on with them? Read below what Robert has to say about that. Question: Can you tell us where you started with the pioneers and where you are now with your chess academy? Robert Katende: Yeah, I started, in 2002 and, it really started stabilizing in 2004. There were six, the kids, I have six and I’ve been dealing with them for over now twelve years. The way I keep some of them, in the age, like Phiona, had, like, one year and a half. She was nine, and now she’s twenty. So they have now become young adults. And when I took them they had not even schooling. He’s now qualified as a physics and math teacher. He’s now, he’s just graduating, June, commencing. Benjamin, Phiona, he’s just completing high school to go to university next year. So it’s really a remarkable journey, for me to see them. And, besides they have professional kind of goals, they are naturally becoming leaders. And they reach out to the program that, like Phiona, it’s not just like coincidence, but it’s like a strategy on starting to give them some sense of responsibility, and then also enabling them to realize that they have something they can really, that there is something that they can offer at even their lower level. So they are naturally in this that they should grow. So this, right now, I sit, and we instruct and we plan together with the kids who were the kids then- now they are adults, and we just sit and plan, and the consequence, we can do this, and so I will get on this, and then they bring their report. I’m so grateful because I kind of see myself like I have not planned. Like, even right now, we are weighing all this with over eight kids packed in. Question : Referring to something you said in the book about stepping out of the boat and how you react to fear, and also, for Phiona, how to react when you feel defeated like you felt in Russia when you’re crying and devastated. How do you react in those situations? Robert Katende: Yeah, that is true, but in most cases it is fear. It hinders a lot in many cases especially for the children; that they have nothing to relate to- so no one has ever done it. They cannot connect . So it’s more like, no, you step out. You be there first. You take that responsibility. We just offer have real-life situations. Then the question now is, what do you think is going to change us? You see yourself; Ask the person, what’s going to change this turnaround, to make this happen. So it’s like you start to instill a sense of discipline and responsibility. You need to see it from their perspective; not look at all- I wish my aunt had done this; oh, I wish my mom was available, but and my personal life, I tell them, look at me. I’m a typical orphan; I never knew that things would ever change. But in every case, I had to keep on trying. I’d rather try than fail to try, and then I say it didn’t work out. There are moments when I go I wanted so much to do, I was really good in academics, but I can imagine what you are reading today. You have exams in two weeks, but you’re not sure whether you’re going to see them because you don’t have, you don’t realize the future. So you ask many times , why should I really? If it doesn’t happen, I will have done my part. So that’s the kind of approach I take. Phiona Mutesi : My reaction whenever I would lose a game, most of the time I would cry, like, maybe today, with the pain of pressure, that’s when I cry most. Like whenever I was in Uganda, I could do most of my games, so here I am; I’m coming to Russia; I thought everything is going to small. Yet, I forgot about that this before, that is a different experience from Uganda and , so from that, I think I got an experience- a great one, and got to learn everything, so it doesn’t affect me anymore. Whenever I lose, it’s just part of the game. I just had to learn from that. Blogger : Coming to the U.S., what are the cool things you’ve gotten to do, so you can brag about it to your friends? Did you have French fries with ketchup? Phiona Mutesi : I’ve been having that and I got tired of it. I think the coolest fact is walking on the Red Carpet. Question : Phiona, you’re definitely and inspiration. What advice would you give to a young girl that’s scared of stepping out? Phiona Mutesi : Well, what I know, it’s not, like, as well problems- I’ll say, most people when they’re like, they’re having problems, but it just takes hope. Have hope in everything you’re doing, and just be hard working, and just approve about yourself; you feel like, no, I don’t wanna be like this. Have a dream, I want to be this in my life. So that, really, right, you’re like, I don’t want to be like this. Question : What was it like working with Madina and David who played you in the film? Did you work closely with them? How much did you get to coach your character on set? Phiona Mutesi : Well, I wasn’t on set. I met Madina once. We talked, and when I talked to Madina, she came late; So it was like, it was kind of similar but kind of a difference. It, yeah, so I ended up coaching her. So I was, just— . And with Mira, I’ve been Mira, so she’s been coming to the academy. Robert Katende : Yeah, and I had an opportunity to really not do much, but I think I did more from the start. It’s really very happy watching and, even on set, I think to me, it was more intimidating because I think that never- portraying someone is a lie, and what’s so called, someone is really. That was a big challenge but, it was very free; very open, and he would come to me, Robert, and asking every time, Robert, anything you can find that is not in line, let me know. And then even before he goes for, in his, he would come and say, Robert, how do you say this? So I’d just go through his lines; what would you say to Sara because you are in this situation? So you wanted to know this to make sure that he’s in line with everything. It was really in the collaboration but, in most cases, he was really trying to find out. So maybe in this collaboration part when Phiona won the tournament, I’m not fond of dancing, so I think I did give him an opportunity to. Question: What has surprised you the most in bringing your story to the big screen? This morning, in fact, when I was at the hotel, I was trying to calm down, even the whole country now will try to ask, where is Robert? And yet before, I remember the times when I would even call radio stations seeking for support for education, and no one would ever bother. You’ve got to look for jobs; you will know no one knows you. So it’s quite amazing to see what that stands out to me. And I’m so grateful for the ladies. It’s quite interesting that even this house is full of them. I have the trip, and I have a special place in my heart, right from my grandma, to my aunties, and I think it’s the actual reason why God has given me my little task. 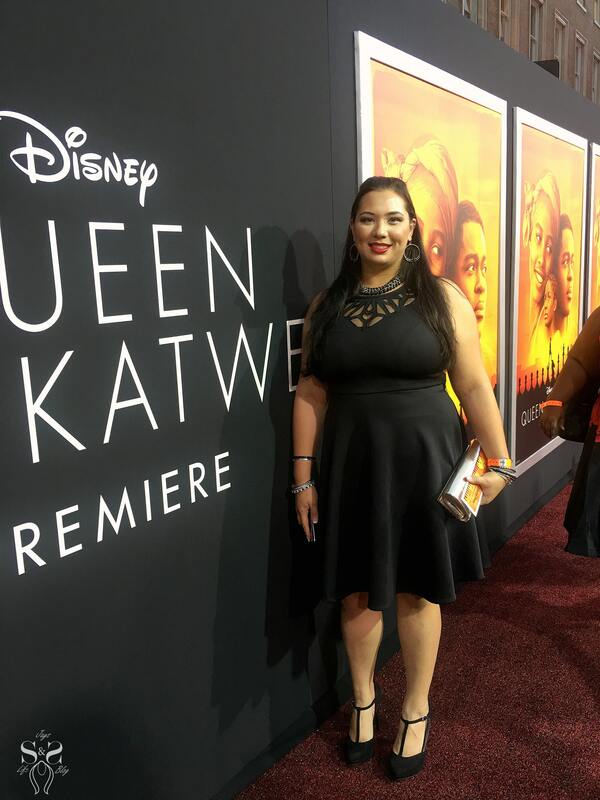 Head over HERE to check out my full Queen of Katwe Movie Review read some memorable quotes from the movie and get an inside look on what to expect. Head over HERE to check out my full Queen of Katwe Interview with the cast Lupita Nyong’o, Madina Nalwanga & Martin Kabanza.